It is never to early to save on your holiday decor. Purchase the HIGHLY Rated Indoor and Outdoor 100 Led Starrry String Lights now only $15.99! Additionally, use coupon code H4GUXM88 at checkout to get them reduced to $13.91. Grab a FREE Trial of Amazon Prime or score Free Shipping with your order of $49 or more! Don’t forget Amazon Prices are subject to change! Get this deal for a String Lights and more Amazon Deals on Frugal Coupon Living. Head to Tiny Prints today and SAVE 50% OFF Address Labels and Gift Tags. Just use coupon code 0918DEAL at checkout to get this deal. I love to use these for labeling gifts instead of using a card. We used some for our Christmas packages last year and everyone commented on them! Tiny Prints stuff is adorable and with this sale I would head HERE to select yours! You will want to narrow your search by theme because there are hundreds of designs! Head to Tiny Prints today and SAVE 50% OFF Address Labels and Gift Tags. Just use coupon code 0625DEAL at checkout to get this deal. Head to Tiny Prints today and SAVE 50% OFF Address Labels and Gift Tags. Just use coupon code 0409DEAL at checkout to get this deal. The codes do not stack but also try code TPH1C15 for 20% off and FREE shipping. This might work out ot a better deal becuase of the FREE S&H. Head to Tiny Prints today and SAVE 50% OFF Address Labels and Gift Tags. Just use coupon code 0205DEAL at checkout to get this deal. Love the Tiny Prints Gift Tag Sale? Find more Photo Deals on Frugal Coupon Living. Do not forget the 140 FREE Vistaprint labels. You can also get the Mattel Sing-a-Ma-Jig Reindeer for $10.99 – the deal above is clearly better. If you have been collecting these items, this could be a nice holiday one to add to your stash. Find more sing-a-ma-jigs on Amazon. Find more Amazon Deals, Seasonal Deals and Christmas Deals on Frugal Coupon Living. 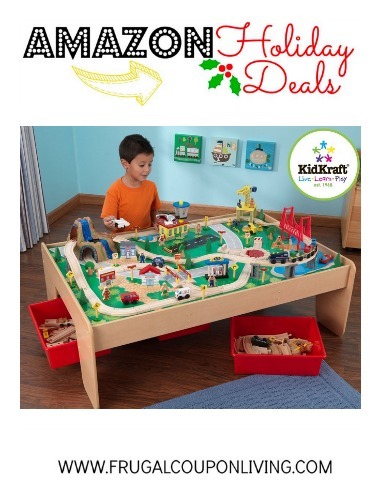 Kidkraft Train Set Table Deal! KidKraft Waterfall Mountain Train Set and Table is now being discounted on Amazon by 31% bringing the price down to $119 from $175! This Train Set and Table is rated a solid 4.75 Star on Amazon from over 100+. Head to Amazon to snag the KidKraft Train Set & Table. Don’t forget you can get a FREE Trial of Amazon Prime. This gives you FREE shipping even for not spending $35. You also get load of free music, free movie streaming, and 2 day shipping – it is a must for the holiday season. Find more Amazon Deals on Frugal Coupon Living. Find more Amazon Deals, Target Deals , and Walmart Deals on Frugal Coupon Living!